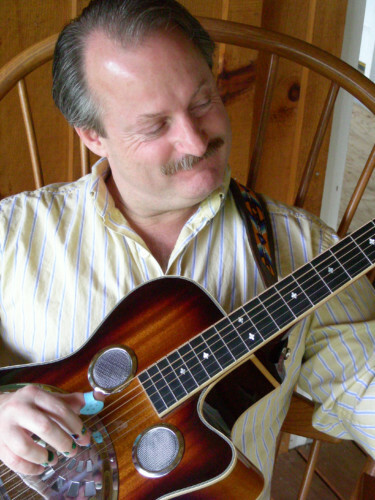 The 333 Coffeehouse, Annapolis’ monthly listening space for folk and acoustic music, is proud to present renowned roots musician David LaFleur. Admission: $10 (students and senior citizens $8). With a rich tenor voice and a mastery of the guitar, dobro, mandolin, and dulcimer, David LaFleur has been performing his unique mixture of folk, blues, and bluegrass for over 20 years. A former nuclear engineer turned full-time musician, LaFleur learned his “chops” performing among such acts as Danny Gatton, Nils Lofgren, and the Johnson Mountain Boys. He has opened for Emmylou Harris, Tom Rush, and the Seldom Scene, and his original music has been featured on TV as well as National Public Radio. In 2004 alone, he received honors in eight national songwriting contests, and he has been featured in many prestigious songwriting showcases, including the Mountain Stage NewSong Festival, at the Kennedy Center, and at the Northeast Regional Folk Alliance. Superb musicianship and a masterful array of thoughtful, and sometimes hilarious songs mixed with dynamic stage presence and dry wit makes LaFleur an entertainer in high demand. He maintains a busy touring schedule, ranging from his home base in West Virginia for hundreds of appearances each year around the USA and overseas. He has also recorded several well-received CDs. His latest, “Them Bones…” (released 2011), explores the traditional roots of his music. Now in its 20th year, the 333 Coffeehouse is an acoustic concert series held the third Friday of every month at the Unitarian Universalist Church of Annapolis. 333 is a non-profit, smoke- and alcohol-free venue run by volunteers. It features traditional folk performers and songwriters. Inexpensive fare is served. With beautiful acoustics and a modest admission price, 333 is a terrific entertainment value.